(Newser) – Roger Stone did little to calm America's overheated political climate with remarks to TMZ this week: The veteran GOP strategist said any attempt to impeach President Trump would cause violence like America has never seen before—and any politician who voted for it would "endanger their own life. "The people who are calling for impeachment are the people who didn't vote for him. They need to get over it," said Stone, a personal friend of Trump who advised his campaign in its early days. "They lost. Their candidate had every advantage: They spent two billion dollars, we spent $275 million. Sorry, we whipped their a--. It is over. You lost." This Chris Farley guy is right, to a degree. This is clearly a desperation move by the White House, and while it is ridiculous and will prove ineffectual, it is nevertheless legal. 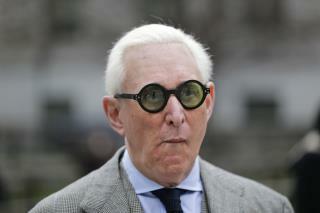 Roger Stone is not a stupid man. He knows where the legal limit is, and he walked right up to it. There is no point in being outraged. Just recognize that the only reason he said it, is that they think there is a real shot that Trump might be impeached. In that sense he is doing the anti-Trump forces a favor. Turn up the heat on your Congresspeople. Tell them to impeach Trump and get rid of Pence for complicity. He looks like Orville Redenbacher on acid. below is proof that our boards lefties cannot grasp the first amendment and are just raging haters. I don't believe this guys opinion.. But its just an opinion.